A new family house located on a sensitive site adjacent to a Grade I listed church in the centre of a picturesque village south of Bristol. The brief called for oak framing to be used in prominent areas and masonry construction elsewhere for economy. We were commissioned to maximise the amount of accommodation on this highly constrained site. The majority of accommodation is located in a storey and half wing, conventionally built in masonry, with bedrooms located within the sloping roof profile due to height restrictions imposed by a restrictive covenant. 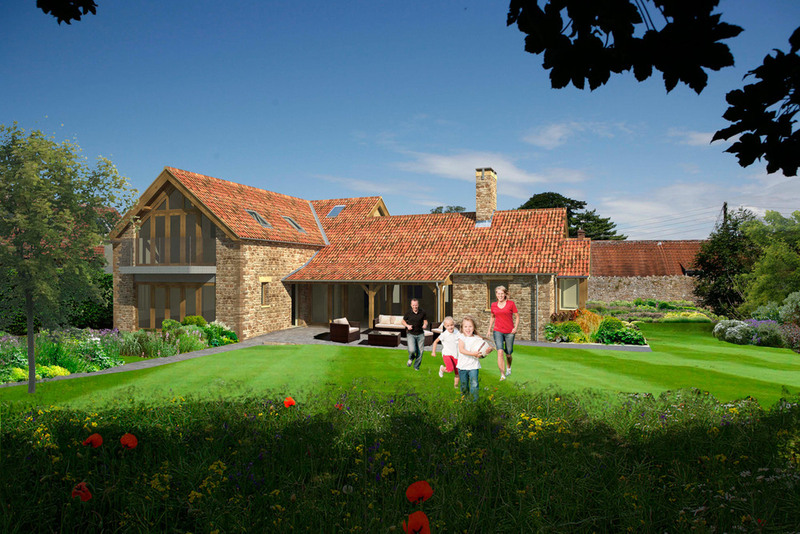 A single storey wing accommodates a vaulted oak framed living room and veranda overlooking the south west facing garden. At the end of the living room a snug with low beamed ceiling, fire place and window seat provide a quiet intimate area in contrast to the larger open plan living area.